There is a swamp a few hours north from town and people tell the strangest tales about it. Some stories are about the dangerous critters that roam just below the surface of the bog water. Other stories are about eerie lights that enrapture people and call them to approach the swamp, people do not return after such visions; a local legend. But the most stories are about the lady of the swamp, the owner of corruption and stagnation in the region. She goes by many names and all the different stories talk about a great variety of deeds and preternatural powers. Not all the stories could be true, could they? The locals call her “Mother Janny”, or simply “The Hag”. Mother Janny lives in a wooden shack in the middle of a medium-sized swamp, her house is located on an island; deep swamp water surrounds it. The old woman lives alone and has few visitors. According to explorers’ observations, she spends her days fishing in the swamp waters next to her shack or carving strange features on bones with a knife. The few times she ever gets a visitor she does her best to sell them her bone craftsmanship pieces. Despite her strangeness and the difficulty to reach her house, some people still find it is worth the risk of crossing the swamp to get to Mother Janny. This is where the local legends about her come into question. Rumor has it that the woman is not just a lonely hermit, but that she is, in fact, an accomplished practitioner of ancient arcane arts. Her magic is unlike what other mages or scholars have seen. She procures her magic from the elemental forces and the fine threads of life embedded in every living thing. When Mother Janny performs an incantation or charm, it is as if she used the strings that bind things together and rewove them into different forms. Her rearranging of the weave that permeates all things translates into sudden physical changes in the real world. It is well recorded in regional historical texts that Mother Jenny has performed some “miracles”; There are mentions about her from up to one hundred years ago. While she appears like an octogenarian woman, even the early reports refer to her as a crone. There is no way to know for sure how old she is or how long she has lived in the swamp. Regardless, the locals try not to bother her with their petty squabbles. The townsfolk only ever dare call for her aid when there is nothing and no one else to turn to. For everyone knows that while Mother Jenny is always inclined to help, no favor from her comes for free. There is always a cost and Mother Jenny does not evade the fact that the cost is an uncomfortable sacrifice for the beggar. She explains straight away that only by paying a costly price can one be worthy of the attention of the immortal beings from beyond. There are two recorded examples of such rituals and sacrifices in local books. The first one is the story of the Lord of the land. The person appointed by the king to rule over the immediate lands in town and around it. This lord had a son who suffered a terrible riding accident. The young boy became a cripple, he would not walk again. After exhausting all alternatives, doctors, medicines, and even magic, the father went to the swamp looking for more answers. Mother Jenny received the man humbly and offered him food and water. After understanding the man’s predicament. Mother Jenny explained that the boy would sure walk, but only if he sacrificed something that was dear to him. It had to be something equivalent to the boy’s ability to walk. Otherwise, there was no point in even trying. The man accepted and the wrinkled face and smile of Mother Jenny were the last things he ever saw. The man’s eyes turned inky black and failed; he was blind. His somber bodyguards helped him return home with despair in their hearts. When they returned, however, the young boy received his father by the door, standing on his own two feet. The second example is a cautionary tale about greed and uncontained desire for growth. It is about a brave warrior, an expert swordsman, and commander. The man had dedicated his whole life to mastering the art of the sword. He was truly a marvel in combat. But he was not the best, nor was he a person of prominence because of his humble birth. He visited Mother Jenny and asked her to help him become the best swordsman the world had ever seen. 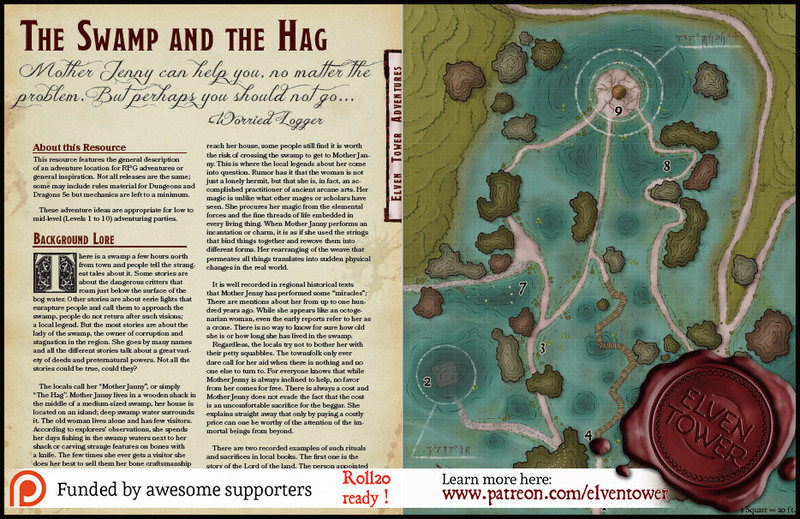 The hag tried to prevent the young man from damning himself and at first turned him away and asked him to return only if he ever was in true need of help. The warrior left her alone for a few weeks before returning to her shack again and demanding the same thing. The hag considered for a moment and decided that nothing would make the young warrior desist, except maybe the true experience of sacrifice. She explained that in order to become the best he would have to sacrifice something as important as being the very best. The warrior, drunk with greed and anticipation, agreed. He argued that he was a poor man and, thus, had nothing to lose. If he were the best with a blade, he could become a knight soon. Later on, a lordship would also be on the table. He could not have been more wrong. The hag agreed and granted him his request. He went outside and tried his blade against the few menacing creatures in the swamp. He could feel the surge of energy and power through his veins. He was now a true master of the sword. He went back and wondered what was the meaning of the sacrifice Mother Jenny mentioned. He found out soon enough during the seasonal tournament in town. It was his opportunity to demonstrate his worth to the lords of the land, so he challenged one of the most respected warriors in the region. It was not until he found himself in front of his enemy on the battlefield that he noticed something was wrong. He held his sword firmly but could not hide the fact that his hand was shaking. A wave of self-doubt assaulted him, the primal fear of survival took over his stiff muscles. As his enemy approached, sword in hand, the warrior could no longer endure the pressure and dropped his own weapon. He yielded and backed away from the fight. It was then that he figured out his precarious position. He was in truth the best swordsman in the world, but this cost him his self-confidence and courage. Never in his life could he raise his weapon against another person out of fear. The Hag, Mother Jenny, holds arcane secrets so powerful she is able to address any situation. She can cure any disease, reform broken or crippled limbs, she can make a man rich or destroy the legacy of one’s enemies; she can even bring a person from the void and return them to life if that is what is asked for her. But the terrible danger in asking for her aid lies in the cost of her favors. No one is sure whether the cost she collects is a fair exchange for her magic, or if she voluntarily chooses to collect such an expensive price when none is needed. Regardless of the answer, Mother Jenny may well be the only solution to a problem but one must consider if the cost is worth the reward. These are the general features of the northern swamp. Terrain. There are a few paths through the swamp. 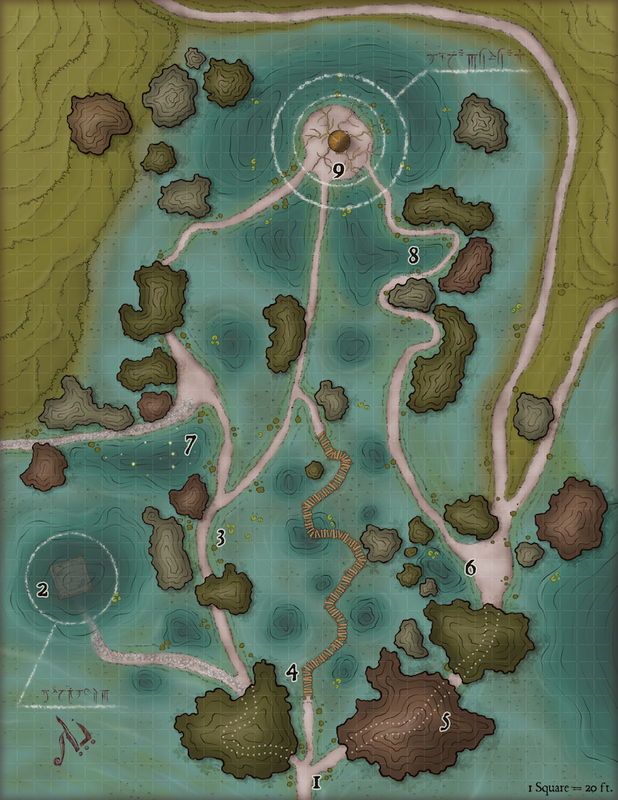 The rest of the terrain is shallow bog water and deep sections of the swamp. Walking through bog water is considered difficult terrain for the purposes of tactical movement. Moving through water areas is guaranteed to attract water creatures. Light. The deep pond in Area 7 is a particularly dangerous area. It is rumored that the area was a communal grave long ago. The glow of several will-o’-wisp attracts unwary travelers to untimely graves. Smells and Sounds. The smell of stagnant water and putrefying flesh is strong throughout the region. The place is unsettlingly silent.